Before receiving my Apple HomePod to review, I found myself in a house in Noe Valley in San Francisco. Apple invited me to see and experience HomePod in a unique home setup before taking one home to try for myself. I’ll spare you the details of the entire demo as there was one demonstration where HomePod’s value was truly made clear. 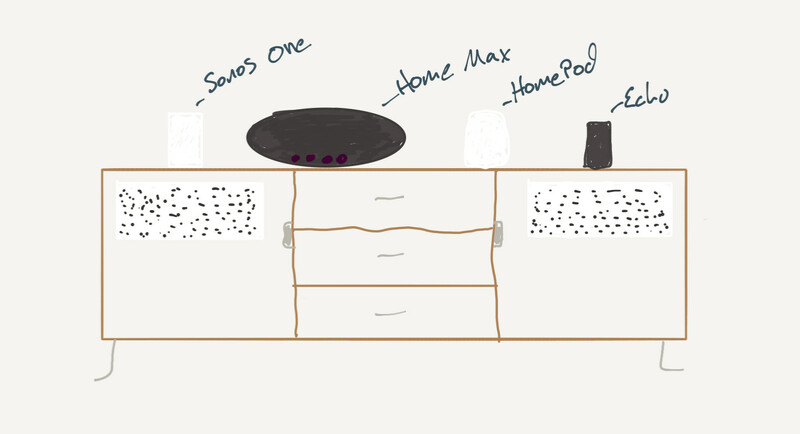 On an entertainment center, that looked like a retro design out of the 70’s with silver and copper knobs, wood like old cedar, and metallic grates, sat a Sonos Play One (Alexa enabled), A Google Home Max, Apple’s HomePod, and an Amazon Echo 2nd generation. This demo was not that different from the one I had in June at Apple’s World Wide Developer Conference. At that event, the demo was HomePod, an Amazon Echo (first gen) and a Sono Play 3. Even in that demo, which was a highly controlled room, HomePod was head and shoulders better sounding. This demo included the much-praised Google Home Max and a quality new speaker from Sonos in the Alexa enabled Play One which I own three of personally. When you listened the comparison of each speaker to the HomePod, you realized how the audio engineers at each company focused on different things. The Google Max focused on bass; it had a lot of bass, so much, in fact, the product ships with a rubber mat it recommends you place the speaker on. Given how much bass the Google Max emphasizes, at the expense of clean vocals and certain instrumentation, I imagine this rubber mat is to help limit vibrations the speaker may make on any hard surface due to the amount of bass it emits. Google Max was too heavy on bass for my preferences. The Sonos Play One, again which I own three personally, was the second best sounding after HomePod. I felt the Sonos sound engineers (in comparison to the others) did a good job balancing sound more in the mid-range and not emphasizing too much bass or too much treble. It was clean and balanced. The Echo sounded the worst by a large margin. But the HomePod was a different audio experience entirely. Listening to these demos side by side, and even once I got HomePod home and had it play in my living room comparing it to my Sonos Play One and my Amazon Echo, what hit me was once you hear the HomePod it is hard to unhear it. Once you listen to it and experience it for yourself, there is no going back. My Sonos, as great as it sounds, and my Echo’s just didn’t sound the same after listening to the same songs on the HomePod. You can’t unhear the quality of the HomePod, and it will change your opinion of many others speakers you may own. There was no going back. I can say, with absolute confidence, the HomePod will be the best sounding speaker many people have ever owned. Many of my friends have asked me how I would describe what HomePod sounds like. With the caveat that you just have to hear HomePod to truly experience it, let me attempt to articulate my experience. HomePod has what can only be explained by the most balanced audio, not just of any smart speaker but of any speaker I currently own. Which includes a number of Sonos speakers, and a Bose Home Theatre system. By balanced, I mean evenly distributed quality sound. With many speakers and sound systems, there is a zone of perfection. That is a specific place, or alignment of your body, where the system sounds the best. HomePod is unique in that it doesn’t have a singular place where it sounds the best. Apple’s engineers designed HomePod to sound the best no matter where you are in the room. In our demo, Apple explained how this was done technically which is beyond my limited understanding of audio engineering. But I did try to prove them wrong and failed. HomePod truly did sound great from any place in the room. The other thing that really impressed me about HomePod was how great it sounded at nearly every volume level. If you have any experience with speakers you know, there is also a sweet spot for volume. Too low and you lost almost all bass, and too high you blow out the high end/treble and often your ears hurt as the high-end parts of the audio start to distort and lose clarity. With HomePod even at low volumes, you heard balanced bass and clarity across the spectrum of sound frequencies as was the case when you put HomePod to >90% volume. What was impressive was how you could stand right next to HomePod even when the volume was quite high and did not feel like your ears were being blown out, and it maintained clarity in the sound. Interestingly, what both the balance of audio, and the way sound is distributed, I found HomePod even sounded terrific at a distance. Meaning when I was in other rooms of my house. HomePod lived in my living room, and even as I moved as far away as the upstairs, I could still hear the distinct bass, vocals, and overall clarity. When I tried the same with my Sonos or Bose, HomePod won in all of these tests of overall audio quality. I have no doubt, HomePod will compete with the best speakers in your house even if you have an expensive/high-end setup. Granted that is not a massive portion of the market, which is why I’m confident in saying that for most consumers HomePod will be the best sounding speaker they have ever owned. Now, we have to talk to about the experience with Siri. It is difficult with me to go as deep as I want here without fully articulating why I feel Siri on HomePod is an important strategic initiative for Apple. I have gone into depth for our subscribers in these articles which I encourage reading. But, Apple’s strategy with Siri has to be zero friction in access to Siri no matter where I am or what I’m doing. Before HomePod being in my home I used Alexa dramatically more than Siri. The reason was simple. I didn’t have to do anything but speak. You may say well Siri is on your wrist, true but I have to raise my wrist and tilt my Apple Watch toward me to initiate Siri. As easy as that may sound, I’m not always in a position to do that, especially when I’m cooking or doing things where my hands are occupied. Second, you may say well Siri is on your phone always listening. True but my phone is not always near me when I’m home. Sometimes I set it on a table in the other room. If it is near me, it is in my pocket. While “Hey Siri” may work when my iPhone is in my pocket it’s an awkward place to engage with Siri. Having Siri on a truly always listening loud ambient speaker creates a true zero friction engagement with Siri in my home. HomePod became my preferred way to interact with Siri, and I found myself using Apple’s assistant dramatically more than I ever did when at home. Confirming to me why this is such an important strategic move for Apple. And luckily, Siri worked very well and delivered on many of expectations and even some of my past criticisms. Now, Siri on HomePod is not much different than Siri on your other Apple products. She is a little more limited on HomePod and can’t do everything you can do on your iPhone. The reason for this is because HomePod is designed to be used by others in your household, not just the person who set it up. This works as expected, Siri can play songs, set alarms, check the weather and do a bunch of general tasks for all those in the household even when the person whose iPhone/iCloud account it is tied to is not there. When it came to music, Siri knocked it out of the park. In fact, because Siri is learning about its owner when you ask to play music, say I said “play Jack Johnson radio” she would say “sure, here is a personalized X for you.” What’s happening is Siri is acting as a “mixologist” as Apple likes to say, but essentially she is playing DJ according to my music preferences. This worked fantastically, and I have about the widest range of music interests as anyone. To me, good music is good music, and I enjoy the creativity of all artists and genres. Usually, this has given Siri troubles, but I found the playlists she generated to be very relevant. Like I mentioned above this feature is not unique to HomePod and functions the same way on other Siri enabled devices, but I make the point because Siri and the music functionality is particularly useful with HomePod given music will be what most consumers use it for primarily. Which is why I was happy Siri delivered on the music experience. One part where Siri on HomePod really stood out against other smart speakers was the communications element, particularly with text messages. Now, this only works for the person who set up HomePod, which in this case was me, but always being able to send messages and have messages read to me was extremely useful in the home environment. Given I’m in Apple’s ecosystem, I knew the communications/productivity part would be the one angle that differentiated Siri from Amazon’s Alexa and Google Assistant. Siri on HomePod is not as full-featured as Siri on your Macs or iOS devices, and this was done by design. Siri on HomePod focused on doing a few things well both for the individual and the communal family of the house and from my experience it did those things well. Alexa and Google Assistant do have more features, for now, but are definitely more advanced in their functionality. Overall, what stood out to me in my experience was the deeper you are in Apple’s ecosystem, the more value you will find from HomePod if you are in the market for a smart speaker. Being able to see what song is playing on your Apple Watch, or quickly move a phone call to the HomePod as a speakerphone from your iPhone, or being able to change songs from your Apple Watch, etc., were all key differentiators for me. Most consumers don’t have as many Apple products as I do, but for those who do HomePod is a great addition to the ecosystem and will be more appreciated in its functionality over competing smart speakers. Thinking about HomePod within the broader market for smart speakers, it is smart for Apple to emphasize not just music quality but even Siri as it relates to Music. Both those use cases deliver 100% on their value. Music (specifically the experience with Apple Music) is where HomePod, and Siri, will shine. Consumers who lean toward these value propositions first and foremost will be delighted. To the question of is HomePod worth the premium over a product like the Sonos One that is $199 and has Amazon’s Alexa, I’d say absolutely if you truly care and are picky about sound quality and/or you are deeply embedded in Apple’s ecosystem. For the time being, if you want a great sounding speaker, with multi-room capability, a bit more full-featured assistant in Amazon’s Alexa (with Google Assistant support coming) then the Sonos Play One is a great option and great value for the money. In fact, the more I compared the Sonos Play One to the HomePod, while HomePod did sound better, I was still impressed with the sound quality of the Sonos comparatively for the price. This space is going to be interesting to watch. We all have our suspicions for how this market may play out, but we now have a legitimately competitive market with lots of options for consumers at many price points and features. Ultimately, this is when a market gets exciting because with all this competition consumers win.